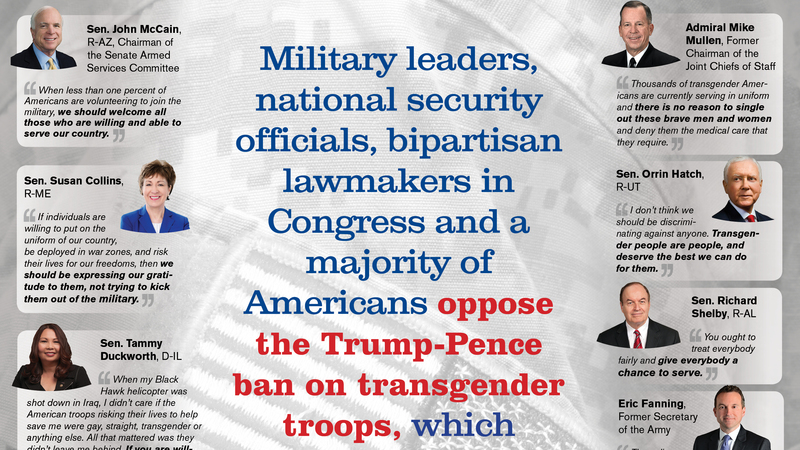 Today, the Human Rights Campaign, Lambda Legal, OutServe-SLDN, American Military Partner Association, and Gender Justice League published a full-page USA Today ad featuring leading military, national security and bipartisan officials who agree with the majority of Americans that the Trump-Pence Administration’s ban on transgender troops is wrong and hurts military readiness. The ad encourages the vast majority of Americans who oppose the Trump-Pence Administration’s effort to ban up to 15,000 active duty transgender troops to call the White House and demand they put our military readiness and brave servicemembers ahead of politics. The ad will also run in every local Gannett paper nationwide on Wednesday. "This ad is a timely and critical reminder of how the Trump-Pence Administration is woefully out of touch, discriminatory, and disrespectful in their position on the brave and courageous service our trans service members demonstrate each and every day," said Matt Thorn, President & CEO of OutServe-SLDN. "From former Chairmen of the Joint Chiefs of Staff to lawmakers on both sides of the aisle, along with a majority of Americans; all have agreed that transgender service members are not a burden but essential assets for our 21st century military, our readiness as a country, and our strategic interests. The President and Vice President should heed the words of our current and former military leaders, our civilian leadership, our congressional overseers, and retreat on their pursuit of this blatantly unconstitutional, discriminatory ban. The bottom line in an all-volunteer force must be if you meet the standards and requirements you should and must be allowed to serve our country, regardless of race, gender, sexual orientation, and yes, gender identity." Making clear the bipartisan opposition to the ban, the ad features quotes from Senators John McCain (R-AZ), Susan Collins (R-ME), Tammy Duckworth (D-IL), Orrin Hatch (R-UT), and Richard Shelby (R-AL); Chairman of the Joint Chiefs of Staff General Joseph Dunford; Former Secretary of the Navy Ray Mabus; Former Chairman of the Joint Chiefs of Staff Admiral Mike Mullen; Former Secretary of the Army Eric Fanning; Former Secretary of the Air Force Deborah Lee James; and General Martin Dempsey. In August, HRC joined as an organizational co-plaintiff in Karnoski v. Trump, a case brought by Lambda Legal and Outserve-SLDN, challenging the ban in court. HRC is joined by the American Military Partner Association, Gender Justice League, and nine individuals as co-plaintiffs in the case. Six separate federal courts have issued rulings blocking implementation of the ban. Barring further court action, the administration cannot implement this ban.